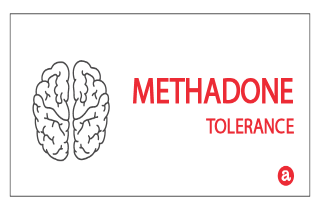 Tolerance to methadone is defined as the need for more methadone (amount or frequency) to achieve effect. But does methadone tolerance indicate methadone addiction? More here. Do you need to take more methadone in order for it to work? If so, you may have developed a tolerance to the current dose of methadone. Does this mean that you’re addicted to methadone and need to treat methadone addiction?… and how is increased tolerance to methadone different than dependence or addiction? In this article, we take a close look at what methadone tolerance is, how long it takes to develop tolerance to methadone and when it occurs. Then, we invite your questions about methadone treatment guidelines and getting help for methadone addiction at the end (we try to respond to all legitimate comments personally and promptly). If you have been prescribed methadone and take it daily as part of a rehabilitation treatment program, it is possible that your body has or may soon develop a tolerance to the methadone. Likewise, if you take methadone to get high, tolerance can occur after regular use. Tolerance simply means that you have to increase doses or take methadone more often in order to feel any effects. But how do you know if you’re developing tolerance to methadone effects, or not? 1. The need for increased amounts of methadone to achieve intoxication or the desired effect. In the case of methadone maintenance, this means that your physician has to increase doses amount or frequency in order to maintain effective craving management and pain relief. In the case of recreational use, the same increase occurs. 2. Diminished effect on the user with continued use of the same amount of methadone. In other words, when you take the prescribed amount of methadone, no therapeutic effects occur. Likewise, if you are taking methadone recreationally, increased tolerance would manifest as no euphoric effect, or the inability to get high. If you are finding that these methadone tolerance symptoms apply to you, don’t worry. This doesn’t mean you are addicted to methadone. Instead, these are only indicators that the effects of methadone no longer work for you. While tolerance, dependence, and addiction can be present simultaneously, each condition is a separate and different entity. Further, if you are using methadone recreationally methadone tolerance can occur within a significantly shorter time period, within a few weeks of continuous daily use. On the other hand, if you are using methadone as an opiate replacement therapy, tolerance will vary with the dose prescribed. It is not uncommon for a higher dose to be prescribed to beginand have that dose gradually reduced or increased over a course of a few months. If your methadone tolerance continues to increase or if you already have a high tolerance to methadone, it may be beneficial to discuss your concerns with your doctor. At times, doctors may prescribe higher doses than normally considered. As a general guide, maintenance dose of methadone to treat opioid dependence is from 20 to 120 mg/day. If you are exceeding the amount of methadone prescribed by your doctor, you probably have a high tolerance to methadone. Additionally, some people may have a high tolerance to methadone because of previous drug use, or previous methadone use. Getting the dose right to suit your circumstances can be difficult and it is important to keep a line of open communication with your doctor during times when you want to make methadone more effective. MDs can help you figure out the best possible situation for methadone cravings and examine possible alternatives. You can lower your tolerance to methadone with the help of a prescribing doctor. But it is important to note that you cannot lower tolerance to your original base level. In other words, there will always be a level of maintained tolerance to methadone. If you want to lower your tolerance, the best way to do so is to seek a doctor’s supervision. Some worry that as they start to develop a tolerance to methadone, this means they are becoming addicted. This isn’t always the case. If you still have questions about methadone, please contact us and we will do our best to help. I’ve been on the m’done roller coaster for 16 years and is my drug of choice (next to clonazapam) I’ve been as high as 220mg and as low as 5mg. I finally had my last dose on Thursday and it’s now Monday. I’m wondering if I have a little tickle today will my WDS start all over again. I never intended to stop using I just want to get rid of my habit so I can have a slap now and then without hanging out (dope sick for our American friends). Methadone might leave your body within 2-4 days but its metabolite might be there for up to 7 days after your last dose. When I am tested monthly at my clinic I don’t show methadone in my Urine after 24 hours but its metabolite is there. They were worried that I wasn’t dosing daily but I am a fast metabolizer. It depends on your physiology/genetics. Stay safe! can you help me to know what the physical symptoms are most commonly associated with methadone tolerance. Have been on same dose for many years but feel it’s not doing the same job anymore. I struggle through most days feeling irritable, tired, unable to concentrate, achy bones but these symptoms are so similar to those of depression I’m confused. How can I know that an increase in methadone is right for me? Hi Kate. The most certain sign that you have grown tolerance to the medication is that it has stopped producing the same effects as it used to. The rest of the symptoms may be experienced because the medication is not doing it’s job because your organism has gotten used to methadone. You can speak with your doctor to either increase your dose or switch you to another medication that will produce the wanted effects. I was on methadone for 5 days starting at 30mg and ending at 50. How long does it take to not show up in a urine test? Hi Debra. In urine, methadone metabolites can test positive for 2-4 days after last dose. So, after 2-4 days have passed since your last use, methadone most probably won’t be detected, but there are slight variations depending on your health state, age, physical condition, level of hydration, etc. Does methadone help with opiate addiction?